Harvey's birthday is today, March 5! He's 23 years old. We celebrate on Saturday the 6th. Harv has traditionally gotten a 1/2 sheet carrot cake, which is shared with the other boarders. This year I need a plan B cake. Why? Last week another horse at our barn turned 23, and his owner brought the most glorious carrot cake ever. It was mounded with cream cheese icing and I gorged on the caloric gooey goodness. Harvey got the cake part. It was just blissful, but at this point Harv and I had our fill of carrot cake. What to do? A different kind of cake? I thought about red velvet cake. Light, moist, lovely to look at, but the flavor? I don't know. Maybe. Brownies? Nope. 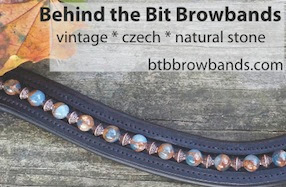 Theobromine in chocolate is bad for horses, and chocolate can causes horses to test positive in drug tests. Banana bread? Downright unattractive, and no icing. A healthy non-dessert? Yeah, right. 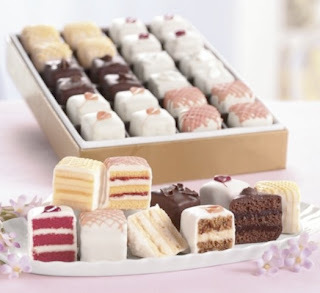 A 36 piece box of Strawberry Shortcake, Chocolate Fudge, Red Velvet, Carrot Spice, Lemon Mist and Royal Vanilla hand-decorated Petits Fours from Swiss Colony! Hopefully Bob will be around to videotape Harv enjoying a sample. I'll share that moment if we capture it. 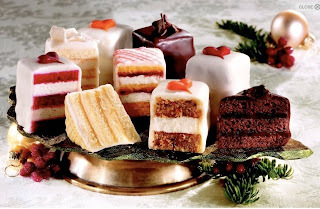 I refer to the Swiss Colony petit fours we get around the holidays are little bite-sized pieces of heaven. Great choice! Happy Birthday, Harvey! Looks to me like you are going to have one heck of a delicious party!! What a great idea for a great horse. Great idea--a little something for every taste! Happy birthday, Harvey and many more! Perfect! There is a little something...or 2 or 3 or 4...for everyone. Happy Birthday to Harv. They make "Frosty Paws" ice cream for dogs. I wonder that there is no equivalent celebratory treat for horses. Ideas? Aw man! I'm just getting over a nasty head/sinus cold - I'm not supposed to be thinking about sweets yet! But between the carrot cake (yum! ), red velvet cake (double yum!) and petit fours (can.not.look!) I am dying for a treat that will do nothing to bring my health back up to speed, LOL! Hope Harvey enjoyed his birthday, and that you got some video! Happy Birthday Harvey! Huey, our TB, had his birthday on March 2! He turned 10. He had a couple of peppermints. They are his favorite treat. Happy Birthday, Harv! I love reading about you and your little brother. You are a good man and I hope you enjoyed your bithday party yesterday! Yummo! I hope Harv had the best birthday ever. Wishing him many more birthdays, too.